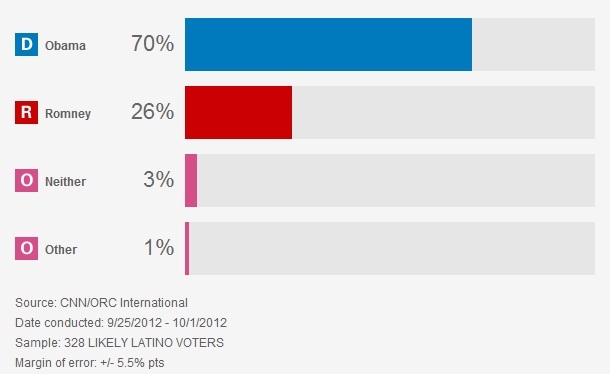 In Tuesday's poll, Romney wins support from 26% of Latino voters questioned. Obama's approval rating has improved markedly among Latinos since 2010, the poll indicated. He stood at 57% approval two years ago, and was at 68% in Tuesday's poll. Twenty-eight percent of Latinos disapproved of the job Obama is doing as president, compared to 41% who disapproved in 2010. When asked to rate their enthusiasm for voting on Election Day, 24% of Latinos said they were extremely enthusiastic, compared to 25% who said very enthusiastic, 24% who said somewhat enthusiastic, and 14% who said they were not enthusiastic. Those numbers are lower than the enthusiasm figures for non-white Latinos, as measured in a CNN/ORC poll taken at the end of September. In that survey, 41% of non-Latino whites said they were extremely enthusiastic about voting in November. 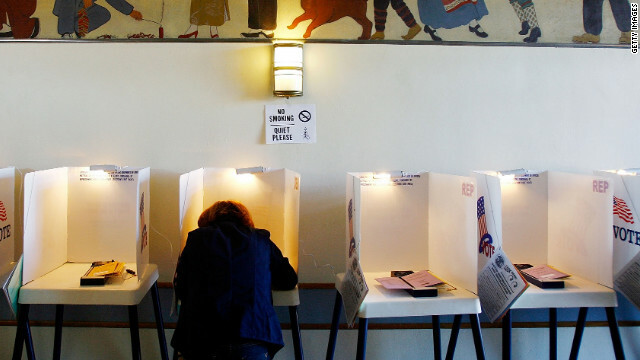 A Pew Hispanic Center report released Monday predicted getting eligible Latino voters to the polls in November would provide the campaigns with a challenge. The report indicated a record 23.7 million Latinos are eligible to vote November 6, but that the turnout rate for the group in 2008 – 50% - was lower than that of black voters (65%) and white voters (66%). In Tuesday's CNN/ORC survey, 44% of Latino adults rated the economy as their top issue, while immigration policy came in a distant second at 14%. Asked to choose between the economy and immigration, nearly three quarters of Latinos – 74% - said the economy was more important. Twenty-three percent said immigration. 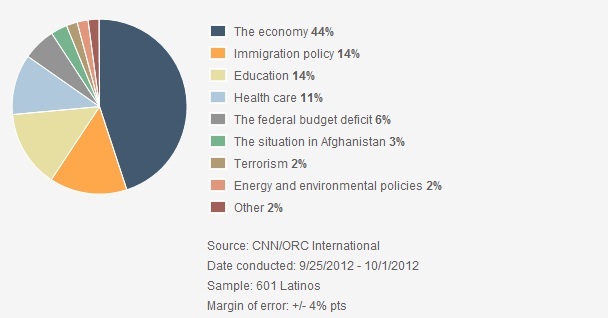 Broken down by topic, 50% of Latinos said unemployment was the top economic issue facing the country. Nineteen percent named the federal deficit, and 15% said gas prices. Large majorities of Latinos named Obama as the candidate who would better handle the issues they rate as most important – 68% said the president would better handle the economy generally, and 69% said Obama would better handle unemployment. On immigration policy, Obama's lead was even greater: 74% said the president would better handle the hot button issue, compared to 20% who named Romney. The CNN poll was conducted by ORC International with telephone interviews of 601 adult Latinos, in English and Spanish, between September 25 and October 1. The sampling error was plus or minus 5.5 percentage points for likely voters, and 4 percentage points for all Latino adults. For those that are saying that we 70% of Latinos that are voting for Obama because he is black. That is just not true, we are voting against Romney, not because he is white but because he is Arrogant and totally out of touch with with the average person. Personally I don't trust him if he has to hide his tax returns. He talks crap to his rich friends, he won't say publicly. He obviously sees nothing wrong in sending jobs to China. Voting for the GOP is like voting for the 14th century. I'm still disappointed. Mitt Romney has only 1% support of the African-American vote and likewise, it should be the same with the Hispanic vote. Then again, I'm sure by election day, the 26% would be all be voting for President Obama. this group should be 99 percent obama. geeze.. you just can't fix stupid. Romney just loves Latinos....he thinks everybody should own one. I'm latino and I'm voting for Romney and most of my family (about 80 of us) are also voting for Romney. By the way, I did build my own business!